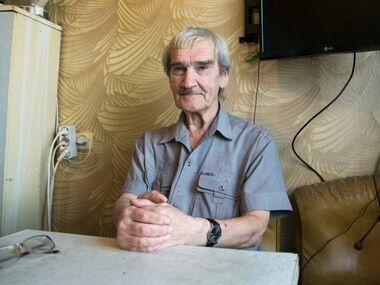 Moscow: Stanislav Petrov, a former Soviet military officer known in the West as "the man who saved the world" for his role in averting a nuclear war at the height of the Cold War, has died at 77. Petrov's German friend, Karl Schumacher, said Tuesday that he died on 19 May. Schumacher called Petrov earlier this month to wish him a happy birthday, but was told by Petrov's son Dmitry that his father had died. The Russian state Zvezda TV station only reported the death on Tuesday. Petrov was on night duty at the Soviet military's early warning facility outside Moscow on 26 September, 1983, when an alarm went off, signalling the launch of several US intercontinental ballistic missiles. The 44-year-old lieutenant colonel had to quickly determine whether the attack was real. He chose to consider it a false alarm. The incident occured at one of the most harrowing periods of the Cold War when the Soviet Union appeared to genuinely fear a surprise US nuclear attack. Only a few weeks earlier, the Soviets shot down a passenger plane flying to South Korea from the US, suspecting it of spying, killing all 269 people aboard. The United States, after a series of provocative military maneuvers, was preparing for a major NATO exercise that simulated preparations for a nuclear attack. "I realised that I had to make some kind of decision, and I was only 50/50," Petrov told the AP. If he had judged it a real launch, the top Soviet military brass and the Kremlin would have had no time for extra analysis in the few minutes left before the incoming nuclear-tipped missiles hit Soviet territory. They would have likely ordered a retaliatory strike, triggering a nuclear war. "It was this quiet situation and suddenly the roar of the siren breaks in and the command post lights up with the word 'LAUNCH,'" Petrov told the AP. "This hit my nerves. I was really taken aback. Holy cow!" Within minutes of the first alarm, the siren sounded again, warning of a second US missile launch. Soon, the system was reporting that five missiles had been launched. Petrov recalled standing up as the alarm siren blared and seeing that the others were all looking at him. Everyone was confused. Although his commanding officer did not support Petrov at the time, he was the one who revealed the incident after the Soviet Union collapsed in 1991. If Colonel General Yury Votintsev had not spoken out, Petrov said he "would have forgotten about it like a bad dream." After the story was told, Petrov received accolades, international awards and became known as "the man who saved the world."